Are you searching for how you can get out of jury duty in a legal case from court? 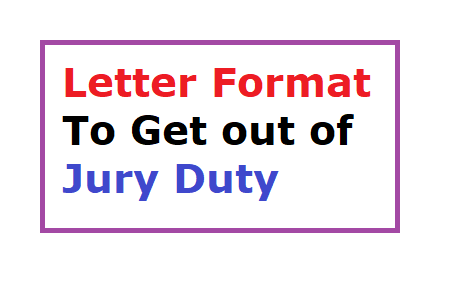 Then this letter format will help you to inform your court that you are not able to present in the jury panel. Read on! Suppose if you are asked to perform a jury duty for a particular case in court and you somehow agreed to be in the jury duty panel, but due to some unavoidable reason, you are not in a position to attend your jury duty on a particular date, then you must submit a written request letter to your court concerned. You may submit the letter in person or you can send the excuse letter of jury duty through postal to reach the judge of the court on time. You may also approach the clerk of the court and submit your request letter as the clerk is mostly collecting such documents to file. It is upto the court to decide to grand permission for you to get out of jury duty. Before writing the letter to get out of jury duty, make note of the date and time for jury duty which can be seen in your summons sent by the court you concerned. Here is the format of letter and you can use it for your purpose and may be needed to modify according to your reason. I am in a receipt of your letter dated June 23, 2018. Though I feel proud to be in the jury panel, I respectfully request that I am being excused from Jury duty on the said date August 30, 2018. The reason why I am not able to attend the jury duty I accepted earlier is my professional work concerned. I am here in a small firm where I am responsible for everything in the office and the said date for my jury duty is a busy day for my concerned form and so I am not in a position to attend my jury duty. I am free on another day 15th September 2018 and I am happy if the later date is fixed for me to do my jury duty if the court wishes. I have also attached the authorized document from my employer to explain my situation. I hope you understand my situation and excuse me from jury duty. If you need, you may contact through my phone _____________ for any other clarifications. Thanks in advance! 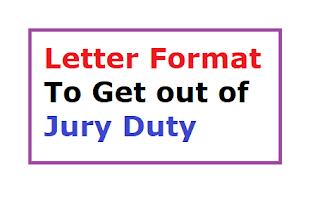 Note to visitors: This letter format to get out of jury duty provided above for educational purpose only and you may use it for writing a letter that fits for you. You may need to alter the reason according to your situation. It is strongly recommended that you should put only one strong reason to get approved your jury duty excuse letter. If you put so many reasons, you may get rejection.